The Douglas DC-6 is a piston-powered airliner and transport aircraft built by the Douglas Aircraft Company from 1946 to 1958. Originally intended as a military transport near the end of World War II, it was reworked after the war to compete with the Lockheed Constellation in the long-range commercial transport market. More than 700 were built and many still fly today in cargo, military, and wildfire control roles. The United States Army Air Forces commissioned the DC-6 project as the XC-112 in 1944. 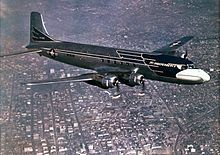 The Army Air Forces wanted a lengthened, pressurized version of the DC-4-based C-54 Skymaster transport with more powerful engines. By the time the prototype XC-112A flew on 15 February 1946 the war was over, the USAAF had rescinded its requirement, and the aircraft was converted to YC-112A, being sold in 1955. 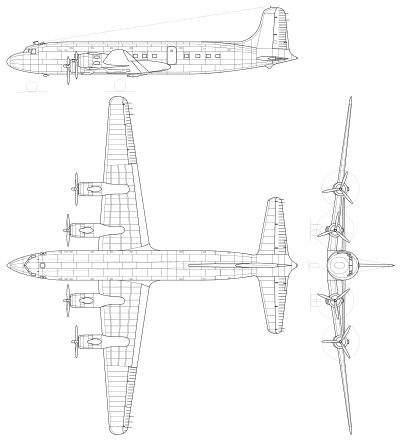 Douglas Aircraft modified the design into a civil transport 80 in (200 cm) longer than the DC-4. The civil DC-6 first flew on 29 June 1946, being retained by Douglas for testing. The first airline deliveries were to American Airlines and United Airlines on 24 November 1946. A series of inflight fires (including the fatal crash of United Airlines Flight 608) grounded the DC-6 fleet in 1947. The cause was found to be a fuel vent next to the cabin cooling turbine intake; all DC-6s were modified and the fleet was flying again after four months on the ground. In April 1949, United, American, Delta, National, and Braniff were flying DC-6s in the United States. United flew them to Hawaii, Braniff flew them to Rio de Janeiro, and Panagra flew Miami-Buenos Aires; KLM, SAS, and Sabena flew DC-6s across the Atlantic. BCPA DC-6s flew Sydney to Vancouver, and Philippine flew Manila to London and Manila to San Francisco. Pan Am used DC-6Bs to start transatlantic tourist-class flights in 1952. These were the first DC-6Bs that could gross 107,000 lb (49,000 kg), with CB-17 engines rated at 2,500 hp (1,900 kW) on 108/135 octane fuel. Several European airlines followed with their own transatlantic services. The DC-6A/B/C subtypes could perhaps fly nonstop from the eastern US to Europe, but needed to refuel in Newfoundland (and perhaps elsewhere[where?]) when flying westbound into prevailing westerly winds. Douglas designed four variants of the DC-6: the basic DC-6, and the longer-fuselage (60 in (150 cm)) higher-gross-weight, longer-range versions—the DC-6A with cargo doors forward and aft of the wing on the left side, with a cargo floor; the DC-6B for passenger work, with passenger doors only and a lighter floor; and the DC-6C convertible, with the two cargo doors and removable passenger seats. The DC-6B, originally powered by Double Wasp engines with Hamilton Standard 43E60 constant-speed reversing propellers, was regarded as the ultimate piston-engine airliner from the standpoint of ruggedness, reliability, economical operation, and handling qualities. 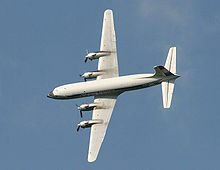 The military version, similar to the DC-6A, was the USAF C-118 Liftmaster; the USN R6D version used the more powerful R-2800-CB-17 engines. These were later used on the commercial DC-6B to allow international flights. The R6D Navy version (in the late 1950s and early 1960s) had Curtiss Electric constant-speed reversing propellers. The USAF and USN renewed their interest in the DC-6 during the Korean War, and ordered 167 C-118/R6D aircraft, some of which later found their way to civil airlines. Harry Truman's first presidential aircraft was an Air Force short-fuselage DC-6 which was designated VC-118, and named The Independence. It is preserved in the National Museum of the United States Air Force at Dayton, Ohio. In the 1960s two DC-6s were used as transmitter platforms for educational television, based at Purdue University, in a program called the Midwest Program on Airborne Television Instruction. Many older DC-6s were replaced in airline passenger service from the mid-1950s by the Douglas DC-7, but the simpler, more economical engines in the DC-6 have meant the type has outlived the DC-7, particularly for cargo operations. DC-6/7s surviving into the jet age were replaced in frontline intercontinental passenger service by the Boeing 707 and Douglas DC-8. Basic prices of a new DC-6 in 1946–47 were around £210,000–£230,000 and had risen to £310,000 by 1951. By 1960, used prices were around £175,000 per aircraft. Prices for the DC-6A in 1957–58 were £460,000–£480,000. By 1960, used prices were around £296,000. Equivalent prices for the DC-6B in 1958 were around £500,000. Used prices in 1960 were around £227,000. From 1977 to 1990, five yellow-painted Douglas DC-6Bs were used as water bombers in France by the Sécurité Civile. They were registered F-ZBAC, F-ZBAD, F-ZBAE, F-ZBAP, and F-ZBBU. Initial production variant produced in two versions. DC-6-1159 a 48- to 64-seat trans-ocean variant with extra crew, increased fuel capacity to 4,722 US gallons (17,870 l), increased takeoff weight to 97,200 lb (44,100 kg) and 2,400 hp (1,800 kW) R-2800-CB16 engines. 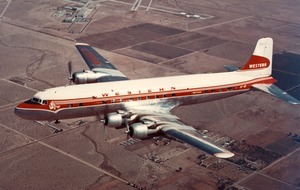 Freighter variant; fuselage slightly lengthened from DC-6; fitted with cargo door; some retained cabin windows, while others had windows deleted. Originally called "Liftmaster" as USAF models. The rear cargo door came standard with a built in 4,000 lb (1,800 kg) lift elevator and a Jeep. The Jeep was a public relations stunt and shortly after, was dropped. DC-6B-1225A a 42- to 89-seat trans-ocean variant with increased fuel capacity to 5,512 US gal (20,870 l), increased takeoff weight to 107,000 lb (49,000 kg) and 2,500 hp (1,900 kW) R-2800-CB17 engines. United States military designation for one DC-6 bought as a presidential transport with special 25-seat interior and 12 beds. Today, most DC-6s are inactive, stored, or preserved in museums. A number of DC-6s are still flying in northern bush operations in Alaska and Canada, while several are based in Europe and a few are still in operation for small carriers in South America. One DC-6A, G-APSA, is based in the UK and available for private charter. As of 2010[update], several are in use as freighters or waterbombers in Canada. These planes are no longer used as retardant bombers in the western United States. As of July 2016, Everts Air Cargo in Alaska operates eleven DC-6s and two C-46s, with several more in storage. Their sister company Everts Air Fuel operates three DC-6 and two C-46. As of January 2007, The nose section of DC-6 cn 43128 was transported to Finland and has been restored to its original state. 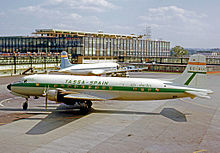 BCPA, TEAL, Pacific Western and others operated this airliner. A great number of airlines and air forces from several countries included the DC-6 in their fleets at some point in time; these are further detailed in the list of Douglas DC-6 operators. As of 2014[update], 147 DC-6s survived, of which 47 were airworthy; several were preserved in museums. S/N 46-0505 Independence - on display in the Presidential Hangar at the National Museum of the United States Air Force, at Wright-Patterson Air Force Base in Dayton, Ohio. This aircraft served as President Harry S. Truman's personal aircraft until he left office in 1953. It later served as a VIP aircraft for other air force personnel, before being retired to the Museum in 1965. S/N 53-3240 - on display at the Pima Air & Space Museum in Tucson, Arizona. This aircraft served as President John F. Kennedy's Air Force One until 1962, when it was replaced as the primary presidential aircraft by VC-137C SAM 26000, and relegated to use as the backup presidential aircraft. It was the last propeller-driven aircraft to serve in the presidential fleet. S/N 53-3255 - on display at Joint Base McGuire-Dix-Lakehurst, New Jersey. Elvis Presley returned to the United States in this aircraft after serving in the US Army in Germany. as of October 2009[update] it was being restored. S/N 51-17651 - on display at the Jimmy Doolittle Air & Space Museum, located at Travis Air Force Base in Fairfield, California. This aircraft served first in the US Air Force and was later transferred to the US Navy as Bureau Number (BuNo) 131602. C/N 45563 - currently flying with Red Bull out of Salzburg, Austria. This aircraft was once the private luxury transport of Yugoslav President Josip Broz Tito. C/N 45550 - displayed at Coventry Airport at Baginton, United Kingdom. Built in September 1958, this aircraft spent most of its life in Southeast Asia, and after serving with the CIA and Royal Air Lao, it was bought by Air Atlantique Group in 1987. Its last commercial flight was on October 26, 2004. It was featured in the 2006 James Bond film Casino Royale. No longer flying, it was converted into a static restaurant at Coventry airport, the "DC-6 Diner". Two DC-6 which belonged to Aerosur, an extinct Colombian airline, are abandoned and parked in Alfonso Bonilla Aragón International Airport of Cali, Colombia. ^ a b Roach & Eastwood, 2007, p. 273. ^ Winchester 2004, pp. 130–131. ^ Winchester 2004, p. 131. ^ "Boeing History: DC-6/C-118A Liftmaster Transport." Archived October 18, 2011, at the Wayback Machine Boeing.com. Retrieved: October 3, 2011. ^ "The Way We Were . . . Education on the Fly." Archived June 1, 2008, at the Wayback Machine ait.net. Retrieved: October 17, 2010. ^ a b c "Douglas: DC-6." Flight, 18 November 1960, pp. 799–800. Retrieved: 27 October 2012. ^ "netpompiers - Douglas DC-6B". www.netpompiers.fr (in French). ^ "Jeep and Elevator Fly With Liftmaster." Popular Mechanics, February 1950, p. 111. ^ "Douglas DC-6." Century Of Flight, 2003. ^ "Douglas DC-6B." The Douglas DC-6 Association of South Africa. Retrieved: September 13, 2011. ^ "Factsheets: Douglas VC-118 'Independence'." Archived December 23, 2011, at the Wayback Machine National Museum of the United States Air Force, June 19, 2006. Retrieved: January 26, 2012. ^ "Aircraft by Name: Liftmaster." . Retrieved: January 30, 2015. ^ "Airmen Restore Aircraft Used by Elvis Presley." elvis.com, June 22, 2011. Retrieved: August 18, 2011. ^ "Outdoor Exhibits - C-118A “Liftmaster”" National Jimmy Doolittle Air & Space Museum, Retrieved: September 20, 2013. ^ "The Flying Bulls - DC-6B History." flyingbulls.at.Retrieved: September 13, 2011. 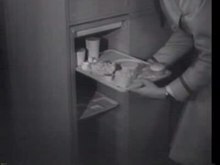 ^ "DC-6 Diner." Archived 2011-11-24 at the Wayback Machine airbasecoventry.com. Retrieved: November 23, 2011. ^ Lozano, Esteban. "VOLANDO SOBRE EL ESPACIO AEREO DE CLO". spottingcali.blogspot.com. Retrieved 17 October 2014. ^ "Douglas DC-6" airliners.net. Retrieved: March 20, 2006. ^ "Douglas DC-6A." American Museum Of Aviation. Retrieved: September 13, 2011. Wikimedia Commons has media related to Douglas DC-6.